TPO is one of the most common types of thermoplastic membranes. It is composed of polypropylene and ethylene propylene polymers reinforced with polyester. TPO roofs are flame-retardant and UV-resistant. Sheets are 6-12 ft wide; however, unlike their PVC counterparts, they come in thicknesses as great as 100 mils. TPO roofing membranes are generally white, with a standard membrane application, ballasting, mechanical attachment or full adherence. Seams are heat welded or hot air compressed. Surfacing is unnecessary except in certain cases. 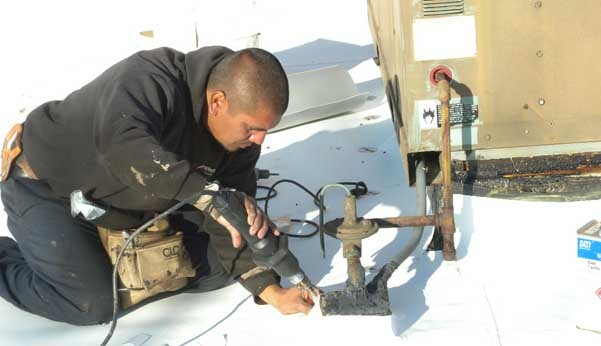 Many TPO roofing problems stem from the material’s increasing popularity. New manufacturers are trying to take advantage of the blossoming market. That said, a good rule of thumb is to consider membranes from a reputable manufacturer with at least a decade of experience producing quality membranes. TPO is an energy-efficient choice. However, to meet Energy Star requirements, the manufacturer must meet the three-year compliance minimum. A quality TPO flat roof needs to be able to withstand 275 degrees Fahrenheit without displaying signs of stress or cracking. Choosing a membrane with a thicker top layer is advisable. The thickness of the top layer is referred to as the thickness over the scrim. Other considerations are whether you want to go with standard white or custom colors, which are less common but certainly available. TPO roofing can cost between 2-4 dollars per square foot for installation and materials. They can have a lifespan of up to twenty years, depending on initial material quality and upkeep. It is best to have a certified, experienced professional preform your TPO flat roof installations to ensure you get the best use and longevity out of your roof. Texas Star Roofing expertly installs TPO roofing. We have experience with mechanically fastened systems as well as fully adhered. We can install over your existing roof or do a complete tear off and install new ISO insulation board. We do new construction projects as well. Whether it’s a 45mil or 60mil TPO roof you’re interested in, count on Texas Star. View our customer locations and schedule your free inspection today. Let us be your best ally in picking the proper TPO roofing membrane. Want to know whether you need roof repairs, and what those repairs will cost? Complete the form to your right for a free roofing inspection in the DFW area!